The year was 1973, and Bill Radomsky started to plant vines at Allegro. Of course, at that point, it wasn't called Allegro (that happened after John and Tim Crouch showed up.) But that spring, Bill planted about an acre and a half each of Cabernet Sauvignon and Chardonnay. He had spent a couple years looking around south-central PA to find the best place to grow grapes, consulting soil maps and talking to folks. This is why we're in Brogue. It's the worst place in the world to sell wine, but the best place to grow grapes. 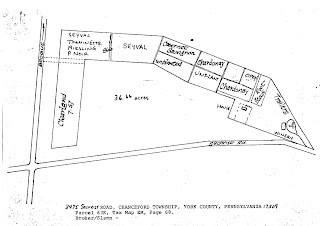 There are only a handful of other vineyards in Pennsylvania that were planted for grape-growing purposes. Most people--wisely--start a winery and vineyard near people so that they can sell wine. This is a prudent business decision. But that's not what we're about at Allegro. We're about growing the best possible grapes. Most people would have thought him crazy at the time. I'm sure the folks in California thought he was nuts. (I still run into people from the left coast who think we can't get grapes ripe here in Pennsylvania.) In 1973, though, even the locals must have questioned him. 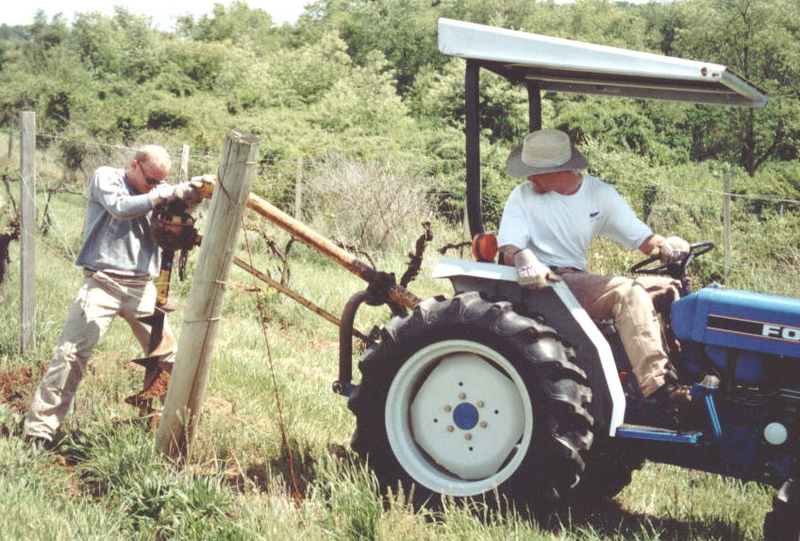 It's the same year that the Hargraves planted the first vinifera vines on Long Island. Dr. Frank in the Finger Lakes had planted some European vines a decade earlier, but word had reached very far yet. Everyone thought these tender varieties couldn't weather the winters here. 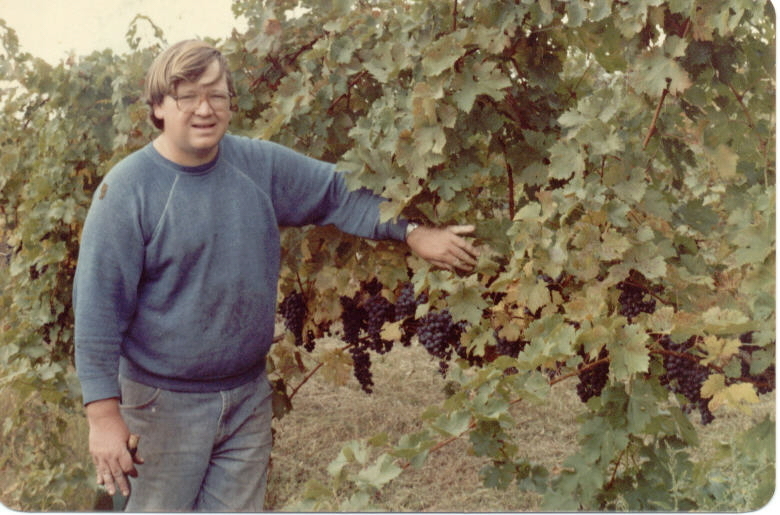 In 1978, the vineyard was sold to John and Tim. Because Bill had been going through a divorce, the vineyard had fallen into some disrepair. It took the brothers all of the following year (1979) to get the vineyard back into shape. Their first commercial vintage was 1980. 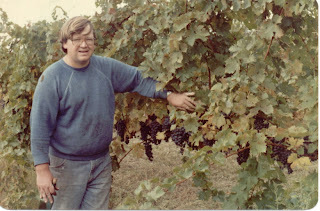 In the early 1980s, the brothers planted some Merlot and some Chambourcin, as well as a rootstock vineyard and an experimental plot. Unfortunately (except maybe in the case of Chambourcin), all of these froze out in the winter of 1994. 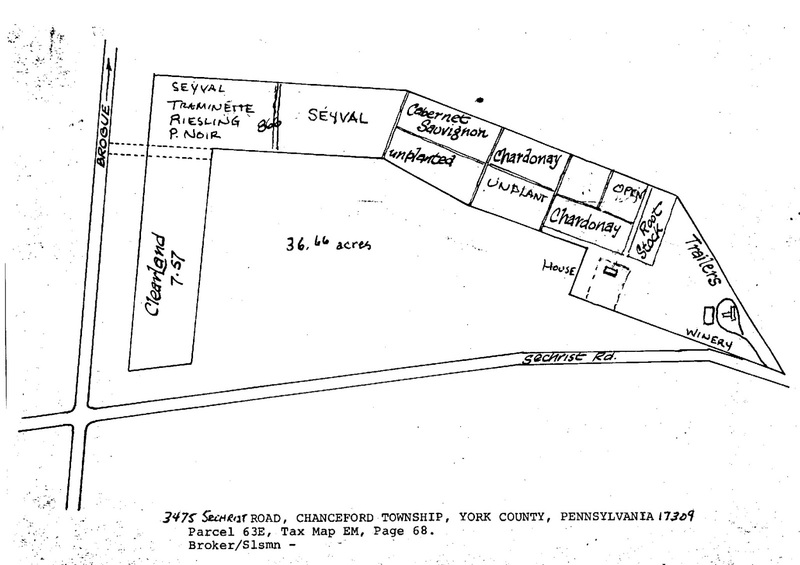 At one time, this place had close to 15 acres planted to vines. When Kris and I purchased the property from John in 2001, I set about re-structuring the vineyard. In late March of 2003, I made the tough decision to pull out many acres, leaving us with just 5. A lot of the Chardonnay was infected with leaf-roll virus, and the Seyval Blanc (planted on its own roots) was too weak to be economically viable. We started to replant the vineyard in 2002, and have steadily added more vines. We have not added much acreage, but we have doubled the density of the vineyard, thereby increasing the quality of the fruit. (It had originally been planted with 12-foot rows and 8-foot spaces between vines. We couldn't move the rows, so we added vines between the existing ones.) After many trellis repairs and years of digging holes to re-plant vines, we're almost up to full strength and looking to the future to plant more vines at this little piece of grape heaven in the Brogue. In case you haven't noticed, this all started forty years ago. Not much in terms of European vineyard history, but for us on the East coast--and myself in particular--this is a long time. So, this is the fortieth anniversary of the vineyard here at Allegro. And on a related note, the 100th blog entry that I've done. We'll try to pull together a nice celebration sometime in April...hope you'll join us. Happy Birthday, Allegro! So glad Carl & Kris found you. So glad I found your wine! So happy you made the decisions you did because Im totally in love with your wines!